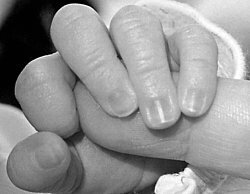 Your baby's nails are soft but sharp thus he/she can easily scratch their delicate skin while waving their hands and feet. When is the Best Time to Cut my Baby's Nails? The best time to cut your baby's nails is when the baby is asleep. After bathing is also a good time because the nails are softer. What Should I Need for Cutting my Baby's Nails? Emery board (baby nail file ) to smooth out any rough edges. Make sure you have enough light to see what you're doing. In order to protect your baby's finger from getting injured, press firmly on the baby's finger pad as close as possible to nail and then cut along the shape of the nail. Round any rough edges with an emery board. Cut toenails right after you finish cutting baby's fingernails. What Should I Do if I Accidentally hurt my Baby’s Finger? Do not worry, it happened to me and it can happen to anyone. If you accidentally nick your baby's finger, use a sterile gauze pad and gently apply pressure to stop the bleeding. Babies tend to put things in their mouth, so to avoid a hazard of chocking do not put bandage on the baby's finger. Ask your partner or sibling to help you with the nail cutting task - While one of you is holding the baby steady the other can cut the nails. Distract your baby with his/her favorite toy. Do not use regular adult nail clippers because they are very sharp and may cut the tip of baby’s fingers.